SpiderOak is a cloud-based tool that can perform several tasks. It can back up important data to the cloud. It provides easy access to all the data stored in the cloud. It will sync data stored in the cloud across multiple devices. And it uses the cloud to let you easily share data with others. SpiderOak is available for multiple platforms: Windows, Mac OS X, Android, and iOS. 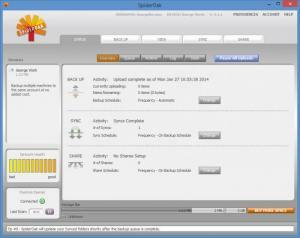 To get started with SpiderOak on a PC, you must first install the application on your PC. After that you must create an account and use it to log into SpiderOak. Installing the application on your PC and creating an account will not take much of your time, and that is quite nice. From the upper right hand corner of the application’s interface you can access the Preferences, the Account, and the Help menu. From Preferences you can access several settings that allow you to customize the way the application works. From the Account menu you can view info about your SpiderOak account. And from the Help menu you can access startup guides, video tutorials, and FAQs. Status – view network health, view a queue of files that are sent to the cloud, access an activity log, access an overview of the backup/sync/share functionality. Backup – select what data will be backed up, start the backup process. View – view all files and folders backed up to your SpiderOak account. Sync – synchronize data between multiple devices. Any file placed in the special SpiderOak Hive folder is automatically synced to other SpiderOak Hive folders. Share – create a ShareRoom and use it to share data with others. A free SpiderOak account gets you 2GB of cloud storage space. If you need more space, you must get a paid account. Get SpiderOak and use it to back up, share, sync, and easily access data. It is a very useful cloud-based application! SpiderOak is available for multiple platforms: Windows, Mac OS X, Android, and iOS. Installing it on a PC will not take long. Creating an account will not take long either; a free account gets you 2GB of cloud storage space. Easily, securely, and efficiently store data in the cloud, back up data, sync data across devices, and share data with others.